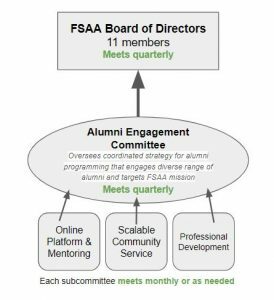 The FSAA has four committees designed to to provide opportunities for Ford Family alumni to stay involved. Committee service can be a great way to contribute in itself, or a place to start if you are thinking of joining the FSAA board. Review the committee descriptions below and if you are interested in serving or learning more, please use our contact form and let us know which committee(s) interest you. The Alumni Engagement committee oversees the programs and communications that engage alumni and manages the subcommittees that execute the specific programmatic work. View committee description and responsibilities. The purpose of this subcommittee is to develop and execute a series of professional development opportunities that primarily serve recently graduated alumni. View subcommittee description and responsibilities. The purpose of this subcommittee is to develop and execute a scalable community service initiative that increases alumni engagement and collective impact. View subcommittee description and responsibilities. The purpose of the Online Platform and Mentorship Subcommittee is to develop a strategy for ongoing engagement on My Ford Family and use of platform to encourage and facilitate mentoring among alumni. View subcommittee description and responsibilities.